Macy's is America’s store for life. The largest retail brand of Macy's, Inc. delivers quality fashion at affordable prices to customers at approximately 650 locations, online at macys.com and through the Macy’s shopping app for mobile devices. Macy's inspires fashion exploration and discovery through the most desired family of exclusive brands for her, for him, for the home, and via our dynamic mobile and social platforms. We know the power of celebration, demonstrated through decades of memorable experiences created during Macy's 4th of July Fireworks® and Macy's Thanksgiving Day Parade®, as well as spectacular fashion shows, culinary events, flower shows, and celebrity appearances. For more than 160 years, Macy’s has, and continues to, make life shine brighter for our customers, colleagues, and communities. More than 150 years ago, R.H. Macy selected the iconic red star to be the company symbol for Macy’s, Inc. Derived from a red star tattoo on his forearm from his sailing days, and inspired by the North Star, he used this symbol as his guide toward an optimistic future. Since its inception, Macy imbedded his sense of exploration and willingness to push boundaries into the very foundation of Macy’s, Inc., and those traits remain evident today. In early 2017, we launched the North Star Strategy with the commitment to return the company to growth. The North Star Strategy reset the fundamentals of our business, yet is flexible enough for today’s dynamic retail environment. From Familiar to Favorite includes everything we do to dial our brand to full bright at all touch points. Actions in this point include understanding and anticipating our customers’ needs and strengthening our fashion authority, as well as executing initiatives around our loyalty and pricing strategies. It Must Be Macy’s is all about delivering the products and experiences our customers love and can only find with us. This includes styles and home fashion for every day and special occasions, from our leading private brands, as well as exclusive national brands or assortments found only at Macy’s. It celebrates our iconic events. This point also encompasses our strategies to appeal to more value-oriented customers in Macy’s Backstage. Every Experience Matters, in-store and online. Our competitive advantage is the ability to combine the human touch in our physical stores with cutting-edge technology. We are enhancing our customers’ experience as they explore our assortments, find their favorite styles, sizes and colors, and receive their purchase through the shopping channels they prefer. We’re also improving their experience in our stores through Buy Online Pickup in Store, Buy Online Ship to Store and At Your Service counters, as well as mobile checkout. What’s New, What’s Next explores how we innovate to turn consumer and technology trends to our advantage and drive growth. Macy’s is a test and learn culture, and we’re focused on creating compelling experiences to drive traffic, increase engagement and create the potential for new revenue streams in our stores. This includes virtual reality technology in furniture, Macy’s Style Crew and The Market @ Macy’s. Funding our Future represents the decisions and actions we take to create resources to fuel our growth. We are focused on cost reduction, productivity improvements and creating value from our real estate portfolio. We will continue to operate with a mindset of continuous improvement. Macy’s world-famous events are unparalleled. For generations, the floral splendor of our annual Flower Shows has welcomed the renewal of spring; the jaw-dropping effects of the 4th of July Fireworks have ignited the night and capped off Independence Day with the nation’s largest celebration; and the Thanksgiving Day Parade has served as the official kick-off to the holiday season with its signature spectacle for more than 90 years. These iconic events are part of Macy’s strong commitment to giving back to the communities we serve. On November 27, 1924, a small group of Macy’s colleagues gathered to celebrate Thanksgiving at the corner of 145th Street and Convent Avenue in New York City. Dressed in costumes with zoo animals, floats and bands in tow, the rag tag group created a one-of-a-kind parade that has since captured the imagination of the world. Much has changed from the roaring 20’s, but one cherished holiday tradition has remained and grown, the annual Macy’s Thanksgiving Day Parade®. Marching down from Harlem to Herald Square that first Thanksgiving to great fanfare, the Parade has become a part of American pop culture and a world-famous event. 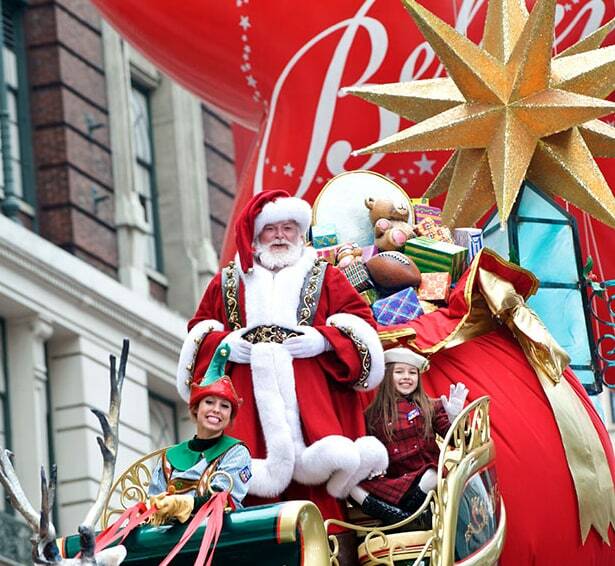 For generations the Macy’s Parade has brought families together to celebrate the start of the holiday season. From the introduction of the Parade’s signature giant helium balloons in 1927, to the Parade’s starring role in the holiday film classic “Miracle on 34th Street,” the Macy’s Thanksgiving Day Parade continues to define the holidays as it brings joy to millions of Americans. Macy’s 4th of July Fireworks® are the nation’s largest 4th of July pyrotechnic display. Produced and designed by Macy’s in collaboration with the world-renowned pyrotechnic family behind PyroSpectaculars by Souza, Macy’s Fireworks are a digitally synchronized display of firepower that is choreographed to rousing popular music and a patriotic score. 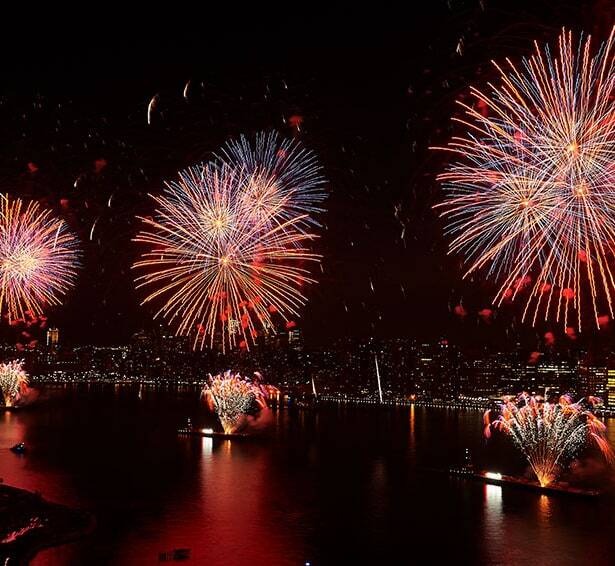 Fired from various locations across New York City, Macy’s Fireworks feature shells and effects from all over the world. Macy’s 4th of July Fireworks are seen by more than 3 million spectators live in New York City, and millions of viewers nationwide. The beauty and renewal of the spring season is showcased in grand fashion each year with the annual Macy’s Flower Show®. 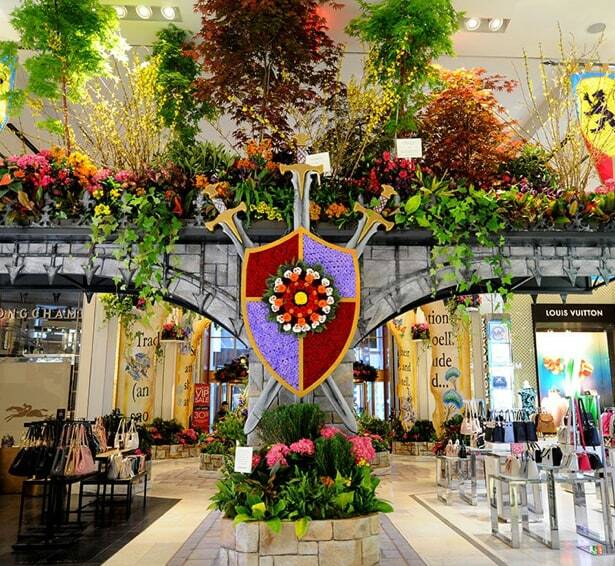 For more than 70 years, Macy’s springtime celebration has delighted generations of floral aficionados with over-the-top presentations of lavish gardens that highlight millions of live flowers, plants, and trees from around the globe. The flora, native to many different landscapes, bloom in unison during the spectacular, giving visitors a truly unique opportunity to enjoy these florals sprouting in one location. The themed showcase takes root in unexpected settings such as store countertops, windows and specially-designed architecture, including grand bridges, columns and topiaries. Macy’s Flower Show is staged annually at three Macy’s flagship locations nationwide including Herald Square in New York City, State Street in Chicago and Union Square in San Francisco. Private brand merchandise is available “Only at Macy’s.” Each of our private brands and labels is designed to fit a niche in our assortment, targeted to a specific consumer through national advertising and given a unique in-store environment. Alfani offers head-to-toe dressing that translates from day to night, for any occasion. It is the modern, wear-to-work brand for the style-conscious woman and man. Offering both elevated investment pieces and core staples for everyday wear, Alfani offers a perfect solution to the career-minded customer. Bar III is the go-to for young, fashion-savvy millennial customers seeking their first workplace wardrobe. The brand offers the latest styles and provides numerous key dress pieces to create versatile looks fit for any occasion, be it the office or a social gathering. Charter Club delivers new modern classics for women looking for polished and timeless styles. Offering well-curated pieces that form a versatile collection, the brand empowers customers with a stylish wardrobe that seamlessly translates from work to weekend. Club Room offers perennial, casual-preppy classics for the modern man that function for work and weekend leisure. Delivering iconic apparel items like the polo, the khaki pant, and the cashmere sweater, these wardrobe staples will be his go-to for seasons to come. First Impressions offers beautiful and colorful clothing sets for newborns and infants. First Impressions Play allows parents to mix-and-match separate pieces to create the ideal outfit for boys and girls. The children’s brand is the favorite choice for those giving gifts with its “satin hanger” collection, perfect for occasion dressing and for “showing off the baby” in fine fabrics and time-honored details. Giani Bernini is a modern yet classic brand of fashion accessories offering a seamless blend of style and practicality. From handbags featuring genuine leather and highly functional, well-organized interiors, to small leather goods, sterling silver jewelry and shoes, all items are crafted using quality materials infused with classic sensibility and modern details. Hotel Collection features an assortment of stylish, sophisticated, and high-quality home goods for the modern customer. The collection offers colorful and versatile pieces that seamlessly balance casual, luxury, and contemporary styles. Ideology provides versatile activewear for all ages. The brand combines fashion and comfort to deliver sport bras, tanks, and leggings that complement an active, healthy lifestyle. Ideology also offers fashionable pieces for layering, as well as more relaxed apparel for men and kids. I.N.C International Concepts features of-the-moment fashion apparel for men and women. Offering the newest and novel trends, customers with a diverse set of needs can find relaxed, casual clothing, denim, and more. JM Collection offers alluring outfit dressing and statement pieces designed for the confident woman with a bold sense of style and color. The brand includes trend colors and prints, novelty knitwear, and tunic silhouettes along with signature embellishments to preserve the customer’s bold attitude. Inspired by Parisian street style, Maison Jules offers the millennial customer an opportunity to cultivate a playful and stylish wardrobe through a curated collection of classic yet modern pieces. The Martha Stewart Collection embodies the aesthetic wisdom Martha has gathered throughout the years as a lifestyle authority in home decor and entertaining. The collection distinctly reflects her taste and style, offering numerous pieces that sport a mix of classical and modern designs. Style&Co. is a bohemian-inspired brand providing casual yet stylish pieces at an affordable price. The collection features romantic blouses, whimsical prints, textured fabrics, and layering pieces that all match back to a great pair of denim for customers looking for a relaxed fit. Tasso Elba delivers European-inspired menswear for the classical customer who appreciates expert tailoring and aspires to enhance his wardrobe with signature pieces. From the polished, casual items of the Island collection to tailored pieces, the brand features luxury fabrics, timeless silhouettes, and sophisticated details. Developed in partnership with music icon Thalía Sodi, the brand features eye-catching, figure-flattering clothing that elevates the feminine wardrobe. From statement-making dresses to body-enhancing silhouettes, to eye-catching shoes and accessories, and bottoms with unique fit attributes, the collection inspires women to live out loud. Macy's on-mall, off-price offering, Macy's Backstage, provides customers value and newness, guaranteeing that with each visit, shoppers will find a compelling assortment of recognizable brands, trends and deals. Macy’s Backstage offers fashion-loving customers another way to shop at their favorite Macy’s store by providing a store-within-store shopping experience featuring significant savings on top-quality products. Macy’s Backstage selection will include fresh product from both new and established brands. Shoppers can expect great savings on apparel for men, women and children, as well as deals on an assortment of housewares, home textiles & decor, cosmetics, hair & nail care, gifts, jewelry, shoes, designer handbags, accessories, and activewear. The Believe campaign is one of Macy’s signature campaigns and is built around a simple premise. 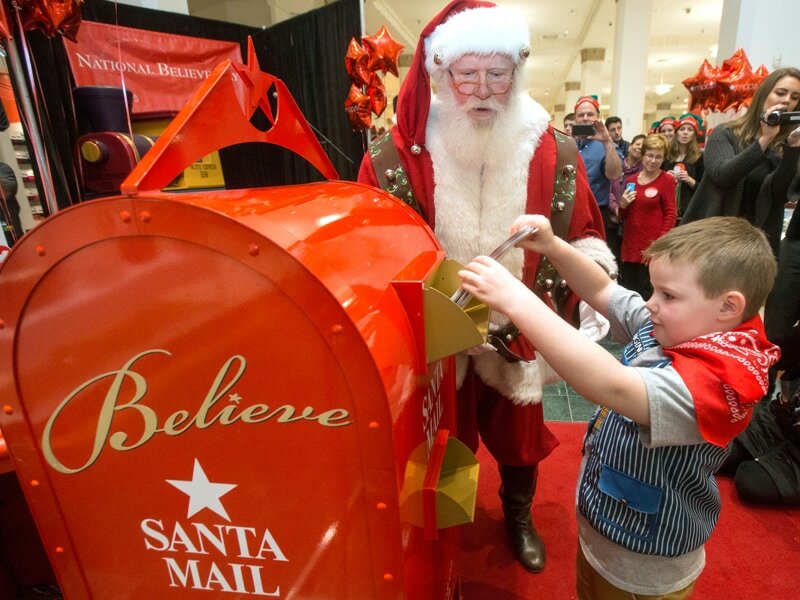 Believers of all ages can write a letter to Santa either in a Macy’s store or online and for each letter received, Macy’s will donate $1 to Make-A-Wish® up to $1 million, to grant the wishes of children with critical illnesses. Thanks to customers and colleagues, 14,000 Wish kids have had their wish granted through Macy’s more than $122 million donation to Make-A-Wish since 2003. To explore a full range of career opportunities at Macy’s, Inc., apply online, or visit our award-winning recruiting website.